Here are my three favorites - font, blog, and online resource! 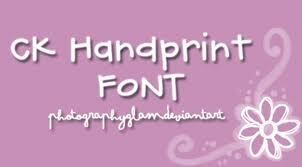 I'm not really big into spending money on fonts or clip art, so before I found CK Handprint I was just using the regular fonts on the computer. I do have the Fonts 4 Teachers pack too that my sister got for me. But CK Handprint is my new obsession. I use it on all of the students' work and parent notes home! It is just too cute and easy to read! Writing this reminds me that I need to type up my newsletter to send home tomorrow! Like everyone else, it is VERRRRRY hard to choose a favorite because I can think of so many! However, today I will give a shoutout to Hadar at Miss Kindergarten! Ever since I saw her Etsy shop with her super cute signs, I wanted one so badly! I was going to wait until I got my first paycheck to buy one........ but I couldn't. So I ordered it last week and it came today! I love it so much. You should get one too! :) I'll update soon with a picture showing it in my classroom!! What are your three favorites? Link up!